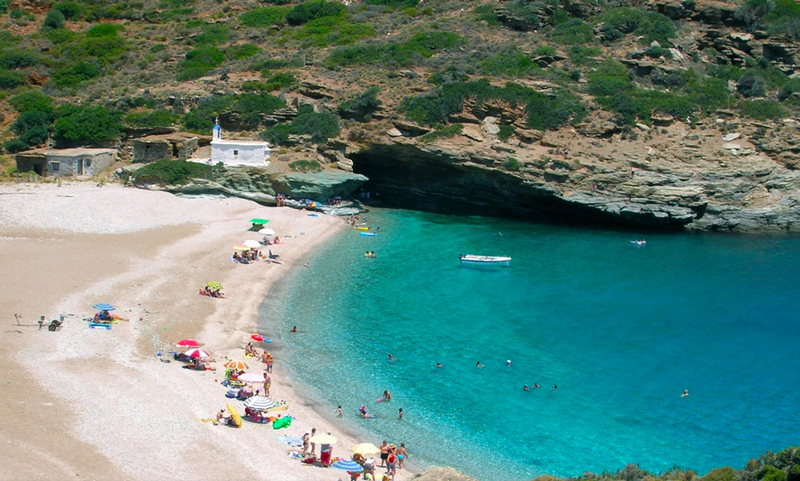 Vitali beach offers one of the most beautiful drives you can enjoy in Andros. It is the road that starts from the area of Gavrio with a length of about 15 km, of which 3km is a dirt road. With some patience and overlooking wonderful views, as your path passes the mountain, this 45-minute trip gives the traveller an unforgettable experience. You start with a car and you end up with a cool dive, in clear blue waters. Vitali Beach has fine pebbles and small and stones, which is especially appreciated during the days when the wind is strong and sandy beaches are impracticable. Moreover, although the waters are deep and crystal clear, they are not very cold as in other beaches on the island. The bath in this small bay is very friendly. Vitali Beach offers natural shade all day, from a rock on its right side. At the same time, it offers shade from umbrellas as it is organized and the beach bar provides sun loungers. Vitali Beach is ideal for diving. All day, young and old people jump into the sea from its high rocks. Finally, the view of the endless blue sea is wonderful and relaxes the visitor’s eye, aside from a small picturesque chapel. All the features together make it one of the most beautiful and unforgettable beaches on the island. The time and effort that the visitor will spend to reach the beach of Vitali, it is totally worth it. Just like everything beautiful, difficulty in the beginning, but with its rewards at the end, justifying the choice.